With six Bundesliga titles, four DFB Cups, three DFL Supercups, a UEFA Champions League, UEFA Super Cup and FIFA World Club Cup, it is hard to believe that David Alaba only turned 25 on Saturday. The two-time Austrian sportsperson of the year (2013 and 2014), as well as his country's Footballer of the Year each year since 2011, has already achieved more than most professional footballers, yet he conceivably still has another decade's worth of trophies to look forward to. Alaba started out at Austria Vienna before moving to Munich in 2009, still just 17. He did not last long in Bayern Munich's reserves, though, proving over just one season that he was ready for the senior team. He took his chance immediately by becoming the Bavarian club's youngest UEFA Champions League debutant in a last-16 tie with Fiorentina. Soon after, he was loaned out to Hoffenheim, but not because Bayern no longer believed in the versatile full-back and midfielder: they sent him on his way with a new three-year contract, and the promise he would come back stronger and more experienced. That prediction proved to be true and the left-side specialist has now been a regular for Bayern since 2011. 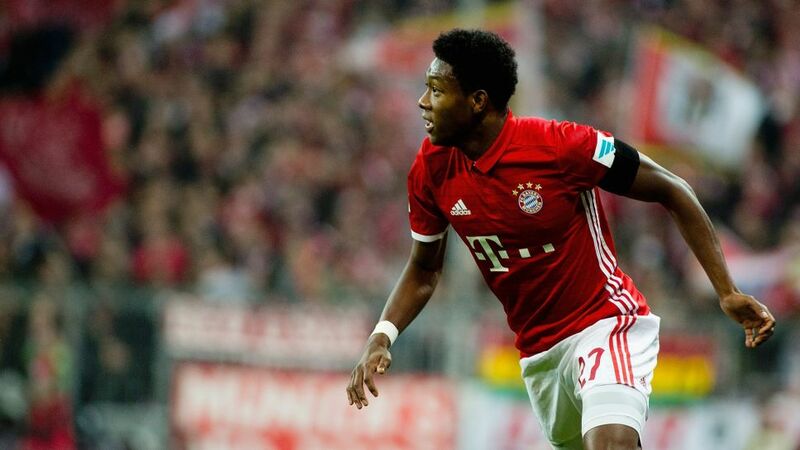 Jupp Heynckes, Pep Guardiola and Carlo Ancelotti all knew that they could rely on Alaba's outstanding qualities, and can have him to thank for the success they have shared at the record champions. Youngest player to appear for Austria at 17.Youngest Bayern Munich player to appear in a DFB Cup and Champions League fixture.Youngest Bayern player to reach 50 appearances, aged 19, nine months and 21 days.Youngest Bayern player to reach 100 wins, in April 2016.Went 105 Bundesliga games without seeing a yellow card.First footballer since 1997 to be voted Austria's sportsman of the year (2013).Record Austrian Footballer of the Year with six consecutive wins (since 2011). Heading into his eighth full season as a Bayern player, Alaba has become the Bundesliga champions' guarantee. With a contract now until 2021, the 25-year-old will have to start making more room in that already brimming trophy cabinet, because more success seems pre-programmed in the career of an exceptional individual.